Calvary Christian eighth grader, Samantha Kavanagh, had a breakout performance this weekend in the 800m. The middle schooler ran a huge PR, US middle school No. 1, and Florida top 10 time of 2:13.81 to qualify for the 2A region 4 meet and gain her first District runner-up title. Last year at this meet, Kavanagh finished sixth in a time of 2:26.39, just missing out on the regional meet. This season, the middle schooler has focused her efforts in the 400m to get speed practice under her belt after coming off a strong cross country season. 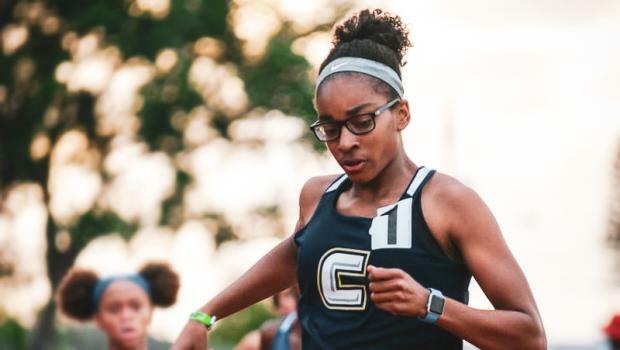 The eighth grader won the Fort Lauderdale City Championships 800m in a time of 2:20.98 just last week and this weekend she shattered her 2:20.98 PR. This performance puts Kavanagh in the top five amongst 2A 800m competitors heading into regionals and states in the next few weeks. The Cardinal Gibbons boys won the first district title since 1981 this weekend in an upset against reigning campions, Hallandale HS. Roman Parodie (100m), Craig Saddler (300mH), Marseille Jackson (high jump), and James Nutt (pole vault) all brought home individual district titles to lead the Cardinals to this historic win for their school's history. The Hallandale girls did it again with another District team championship win with the boys finishing strong in second. The Lady Chargers had impressive performances across the board with Bernadette Laflauer (100m), Kiah Williams (400m), Ashantae Harvey (100mH/300mH), Destiny Castillo (long jump), Anaya Holloway (shot put), and Eriana Sanford (discus) all bringing home individual district titles. Hallandale girls accumulated 142 points to beat American Heritage for the district title with their 125.50 pints. 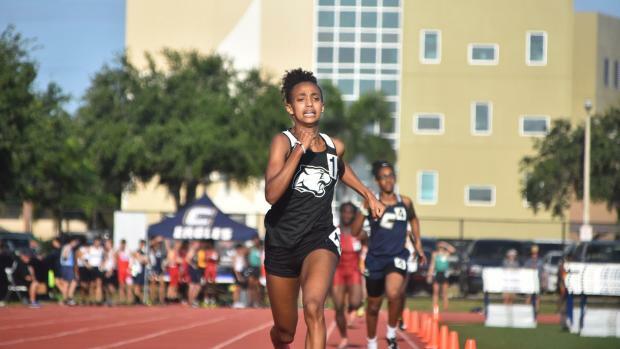 American Heritage had a fantastic weekend with many notable performances. On the girls side: Thalia Dyer, Endeyah Lane, Myrka Cadet, and Sherri-Ann Norton lead the patriots to a runner up finish in the 4x100m in a time of 47.97. While Jadae Barrett, Kenya Thompson, Endeyah Lane, and Thalia Dyer won a district title for American Heritage in the 4x400m in a time of 3:51.92. In addition to these talented sprinters, seventh grader, Ashley Fitzgerald, scored 15 points for the patriots in three events! Fitzgerald qualified for the region meet with a third place finish of 11:37.88 in the 3200m and 5:20.39 in the 1600m. Fitzgerald has had an extremely strong season this year and will be one to watch these next few weeks. On the boys side: Monte Parker brought home an individual district title with his 48.09 400m win, freshman Emory Clemons was runner-up in the 800m in a time of 2:01, and Timothy Butler won the 110mH in 14.62. Vinson Davis, Jacolby Spells, Davonte Brown, and Damian Sutton Jr dominated the field in the 4x100m winning the title in a time of 42.81 over Coconut creek. Parker, Clemons, Sutton, and Jayden Geathers came back to win the 4x400m district title in a time of 3:22.15 after their respective individual races. Tsion Yared is on fire this season and her distance triple win this weekend proves her strength heading into this state series. The Pine Crest junior won the 800m in a time of 2:10.62, the 1600m in 4:59.50, and the 3200m in 11:20.68. She also anchored the 4x400m in an unofficial split of 56.6 to lead the panthers to qualify for regionals. She will be one to watch as she attempts this triple and goes for the state title in all three events this season.